You’ll never understand the pain of being at the opposite end of fake news until you are the one feeling it. Too many people have personally suffered or had their lives shattered by fake news. Few months before the election in 2016 a local morning paper quoted me in a made-up story saying that my opponent won thanks to corruption. Since the election was months away this was a deliberate lie. When I confronted the newspaper I was told, “it’s normal for writers to be creative when trying to make a point. No biggie”. Not only was I severely criticized, but my opponents greedily used this item during the campaign. Fake news is not new. Pheme, the Greek Goddess of false news, was described as having multiple tongues and destabilizing those seduced by her trumpet thousands of years ago (see photo). I get that exaggeration and errors are inevitable in journalism, but fake news is something else -and much more dangerous: it is the spread of deliberate misinformation or fabricated stories with the intent to gain financially, politically or in popularity. The bigger danger of fake news is when people act on misinformation. Hannah Arendt, in “The Origins of Totalitarianism,” asserted, “The ideal subject of totalitarian rule is not the convinced Nazi [..], but people for whom the distinction between fact and fiction no longer exists.” Fake news has pointed out a major flaw of our democracy: it is unsuccessful in guaranteeing good governments since it is subject to the irrationality which fake news today exploits. I have argued before that the time has come to evaluate our Western-style democracy which has not been reviewed since it inspired the French Revolution in the 18th century. Paradoxically the internet’s democratization of news outlets has proven a danger to democracy. People don’t really believe what they’re reading in the mainstream media, so they’re even more prone to want to believe other things that people are spreading. Fake news is like poison that is injected in small doses. It undermines the very fundamentals of a democratic society. So how do we stop it? A handful of countries are in the process of preparing legalization to curb this. One difficulty they face is to come up with a consistent definition of fake news. The second important difficulty is deciding who is going to implement such laws. Governments? Mainstream media? Why trust them if they themselves are sometimes part of the fake news problem? A more viable alternative seems to be independent fact-checking organisations to fight the problem. But maybe the most durable solution is to educate people how to pick up and understand what is fake. I do not have a silver bullet. I do not think anyone does. What I do suggest is for us to have a national conversation on this matter. Sooner rather than later. Our peace of mind and democracy depend on it. 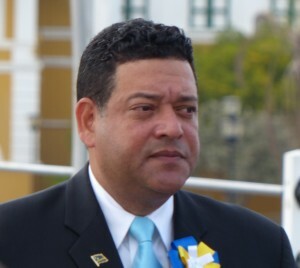 Alex David Rosaria (50) is from Curaçao and has an MBA from the University of Iowa. He is a former Member of Parliament, Minister of Economic Affairs, State Secretary of Finance and UN Implementation Officer in Africa and Central America.